Followed by various tidbits that have caught my eye, or news I think worthy. 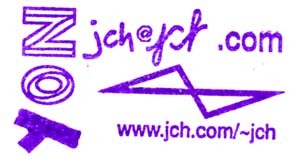 At right is my custom stamp to personalize the other side of my bizcards. 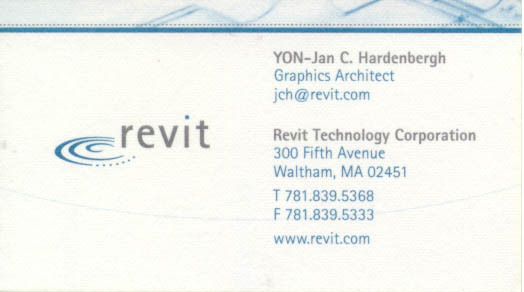 I started at Revit on 8-MAR-2000. It's quite cool. I am a Graphics Architect. I've contributed to many corners of the 3D industry: CAD, PEX, VRML, Volume Rendering, and now back to CAD. 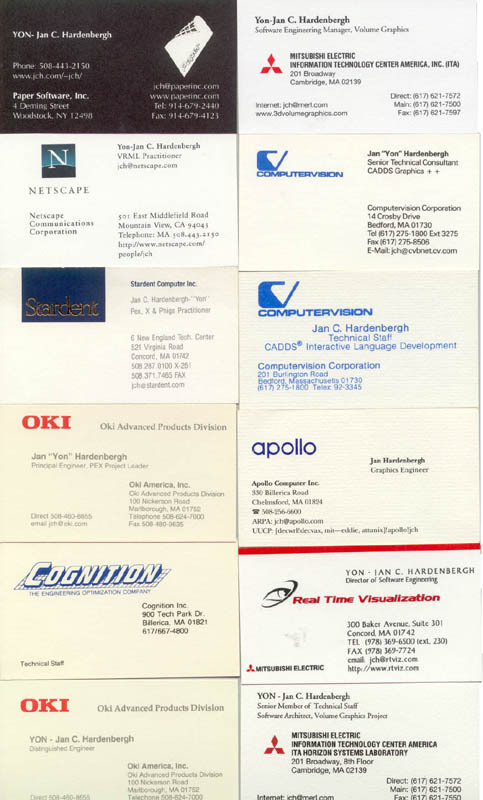 bizcards. I love SIGGRAPH! I teach Sunday School and most other things a parishioner might. SIGGRAPH 2000/New Orleans - great. Almost no responsibilities this year, a far cry from last. GEEK trends, HW for RenderMan, subsurface rendering, and shrinking polygons down to points. The wave simulations are getting VERY credible. Our whole family read Harry Potter 4 within a week, or so. Neal Stephenson's Cryptonomicon was well worth the time and The Lexus & the Olive tree was very good. Aimee Mann and Michael Penn in concert at the Berkeley Performance Center, GREAT! Joan Baez concert - Somerville Theatre 28-MAR-2000 Fantastic!!! Diamonds and Rust, Joe Hill, Sir Galahad, Lone Coyote with a great band backing her up! Ms. Steele in particular - one hilite - Joan imitating Bob Dylan in don't think twice. Truly masterful. See her if you can! March 2000 - updated work bit. Back to Garbage 2.0, Susan Tedeschi, Indigo Girls, Pretenders. Reading Sowa's Knowledge Representation...slowly, also The New New Thing, 7 life lessons of Chaos, The Timeless Way of Building by Chistopher Alexander is great. Putting more family stuff up. SIGGRAPH99 was a personal peak! We introduced VolumePro and I was a co-author on a hardware paper [Pfister99]. I got to demo the chip/board&VLI to the people I respect most and they thought it was cool! And we had the first Hans & YON's party. All risks that must be evaluated. 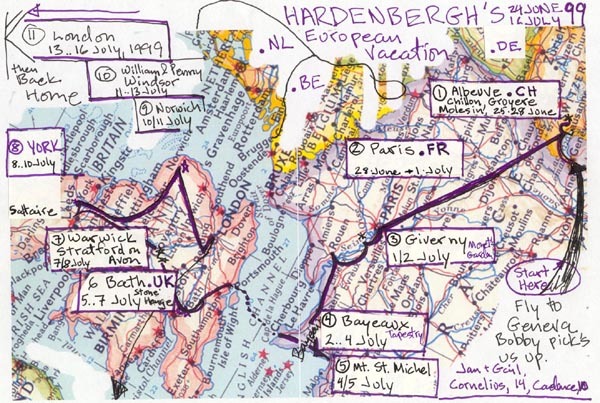 Here is a map and itinerary (136K .jpg) of the Hardenbergh European Vacation, three weeks from Geneva to London. I've been listening to SmashMouth lately. I really liked the Fourth Turning by Strauss and Howe. It is a follow to their generations book. 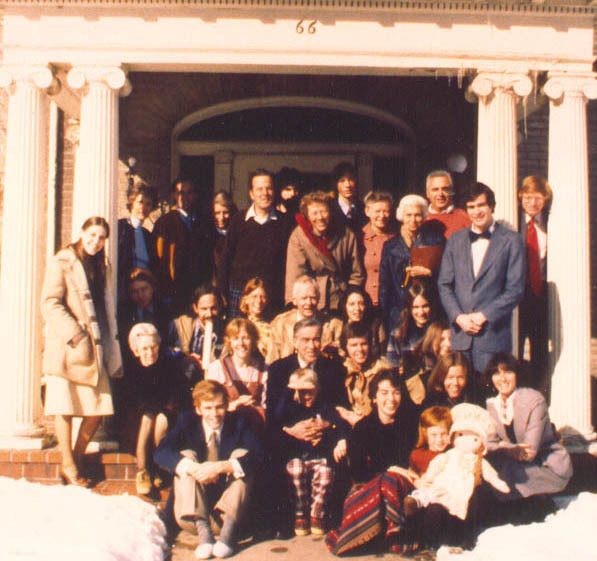 Thesis: There are four archetypal generations: Hero, Silent, Boomer, and Reactives. When the Boomer (Prophets) get older with the young Heroes, there are always fireworks. World War II, the civil war, and the Revolution are the last three. The crisis should begin around 2005. 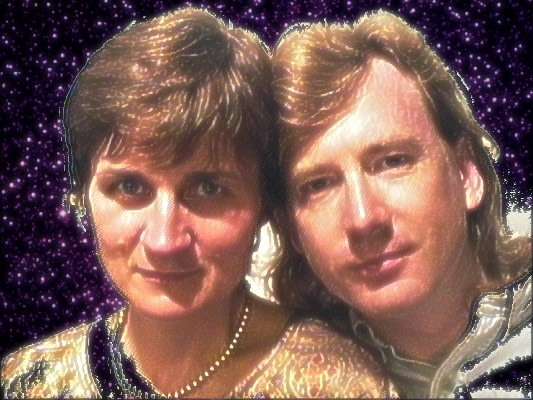 Valentine's day 1999, What I came up with during our after church discussion of "Is UU Really a religion?" I have faith in a benevolent force or pattern influencing the universe. The more our religion - that is to say our faith, spirit, values, traditions, community and worship align with the pattern/force, the more robust our lives become. I'm almost done with Kevin Kelly's New Rules book. I think he is right on the money. 22 immutable laws of branding was fun, too. I saw the McGarrigle Hour concert and like the CD. I got Alanis's new CD and like it a lot, but it is not as addictive as Jagged Little Pill. SIGGRAPH98 - I love history, Volumes are coming; Image based; SIGGRAPH party dynamics next. Radiohead, Meridith Brooks, reading history (middle ages), more amateur brain research reading. International Phonetic Alphabet - just trying to get folks to say YON and write Jan. I have an arm chair interest in neurochemistry & thinking & learning. Check out Neurosmith. Along these lines somewhere is a Universal Semantic Network, or perhaps, there are only many personal semantic nets, each as valid as the other? I'd love to build a simulator of waves on a beach for bodysurfing. I plan to go to Hawaii while I can still play in the big waves. Another life goal is to get a video in the SIGGRAPH videos.